It's technically my Friday, so I felt like a jean skirt was acceptable for today! It's kind of cloudy and damp, yet warm, so I kind of went for layers too. As I said yesterday, I love the bright colors, but today I felt a craving for the muted tones of Fall. And of course, a bird never hurts either. The last time I wore this sweater and was talking about birds, the lovely Vivienne linked me to the "Put a bird on it" segment from Portlandia. Around that same time we had some friends who had been talking about the show a lot too, so the Pants Monkey and I obtained the first two seasons and watched them all in like two weeks. And we've now gone back to watch them again, we loved it that much. We're into the weird, quirky kind of shows like that. If I had a full day with nothing to do, I'd sit and watch shows like Portlandia and Flight of the Concords all day long. My jewelry is on track to be delivered tomorrow. It'll come while we're at the Fair darn it! Oh well, our UPS guy comes pretty late actually, so I'm not too worried about the box sitting outside all day. I am getting so excited about the Fair tomorrow. I never went much with my parents when I was growing up, but once I started dating the Pants Monkey, I've gone every year. It's something special for he and I and we've never missed it, even when he was out of work one of the years. We love to eat all sorts of different food, but for me, I like to people watch even more. It's crazy entertaining. Also, new this year is a MN Craft Beer exhibit with beer flights and as you all know, we love beer. I told Mr. Monkey we have to be careful that we don't just spend the whole day at that booth! I'll be sure to share my "State Fair" style! I'll leave you with the "Put a bird on it" clip if you've never seen it. I highly recommend Portlandia. It's hilarious. Great sweater - have fun at the fair! I love cardigans in general, but I gotta say, I REALLY love yours. It's super adorable! Pairing it with the denim skirt really makes this outfit perfect :) Have fun at the Fair and enjoy opening up your UPS package...hehehe. That cardigan is so cute with the bird on it! Have a wonderful time at the fair tomorrow, eating and drinking! That is a really cute outfit! I love the bird on the cardigan. Have a great time at the fair tomorrow! Love this cute and casual outfit, Beth! The cardigan and bird detail is super cute. This makes me excited because cardigan and sweater weather are also here again! Hope you have a wonderful time at the fair and can't wait to see the new goodies whenever they arrive! 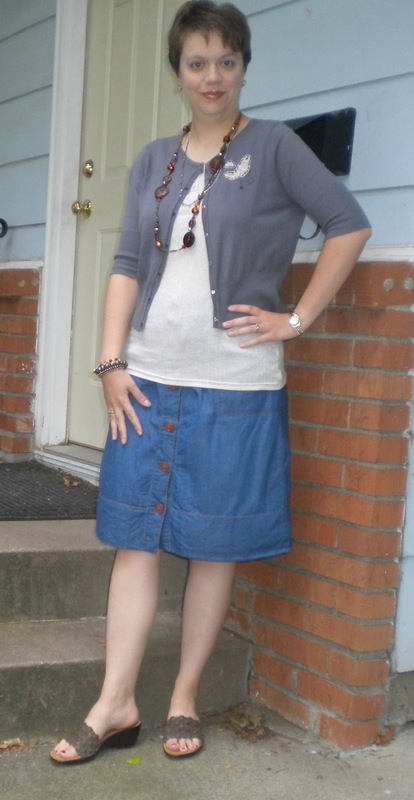 Adorable skirt, it's super cute with the birdy cardigan. Hope you have lots of fun at the fair. I hate when the mailman manages to come the moment I'm not home! Hopefully your package will be waiting for you. That is such a funny show! We actually watch Flight of the concords almost every night! Have fun at the fair tomorrow! Gorgeous outfit:) Enjoy the fair!! Hahaha! I almost bought a wallet today, not because I needed it, but because it had a bird on it! Your cardigan is adorable! What an awesome bird sweater! I have wanted to watch Portlandia but never got around to it. I always enjoy outfits that make my eye "travel well" like looking at a painting. 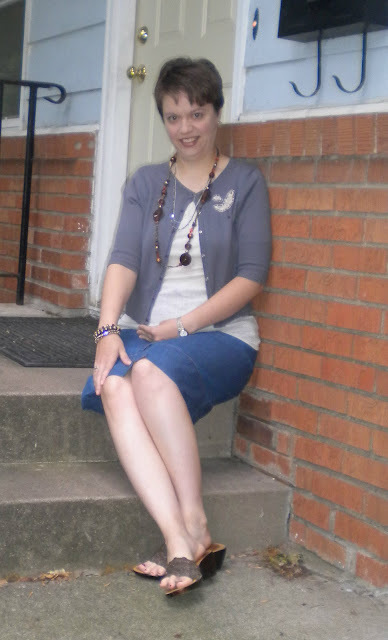 Sweater to shoes back up to necklace then skirt buttons. Good flow. Have a great weekend.